The infrastructure developed in the region will enable us to boost exports, Gazprom Neft says. In less than five years, the Russian oil company has shipped out more than 20 million tons of oil produced in the Prirazlomnaya and Novy Port projects. The latest shipment with Arctic oil is now on its way towards the company’s refinery in Serbia, a press release informs. And more is to come. In a meeting with regional authorities in the Yamal Nenets region today, company Deputy General Director Vadim Yakovlev made clear that several new projects are under preparation and that Yamal in the course of the next 5-7 years will become «the company’s key cluster”. The company now extracts as much as 27 percent of its total production in Arctic projects, regional authorities say. The Prirazlomnoye project was launched late 2013 and is still Russia’s only offshore oil project. In 2017, production amounted to 2,6 million tons, and in 2018, production is planned to increase to 3,6 million tons and in 2020 - five million tons. The Prirazlomnoye is located in the Pechora Sea and holds a total of 70 million tons of oil resources. Extracted oil is shipped by ice-class tankers to the «Umba», a 300,000 ton tanker located in the Kola Bay, near the city center of Murmansk. Since the Prirazlomnoye came into production in December 2013, a total of 5,9 million tons of oil has been shipped from the production site to Murmansk. In 2014, Gazprom Neft started Arctic out-shipments also from Novy Port, the oil field located in the southern part of the Yamal Peninsula. The project out-shipment scheme includes an offshore terminal located in the Gulf of Ob near Cape Kamenny. Since 2015, a fleet of specially designed Arctic tankers have conducted round-the-year exports from site and the volumes in 2017 amounted to 5,9 million tons. In 2018, production is to increase to 7 million tons and in 2019 - 8 million tons. 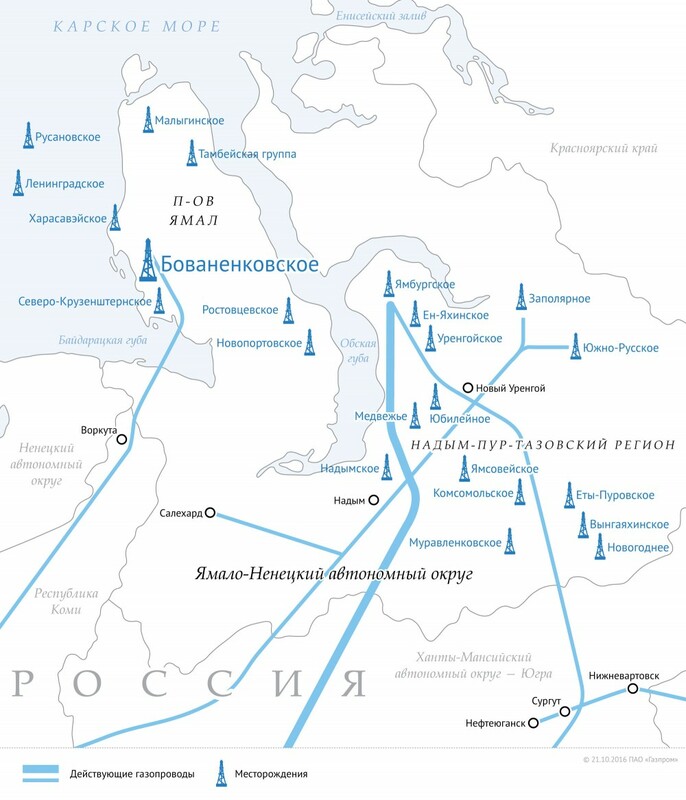 Gazprom Neft also operates the Eastern Messoyakha, the northernmost oil field on the Russian mainland. However, the oil from this field is pipelined through Transneft’s national oil pipeline grid. The company also controls several more licenses in the area, among them to the Western Messoyakha and Tazovsky fields.